The act of forgiving is not easy for most of us. Our natural instinct is to recoil in self-protection when we have been hurt or aggressed. We do not naturally overflow with mercy, grace and understanding when we have been wronged. Moreover, we usually consider the one responsible for our pain or suffering not worthy of our forgiveness or understanding and even worse, worthy to pay for the harm he or she caused us. Thus, the practice of forgiveness is not applied because it is misunderstood and underestimated even though it is promoted by all spiritual traditions and religions as a means to a rapid transformational path, achieving inner peace and happiness. Forgiveness is a condition enabling us to have harmonious, loving, deep relationships, to profoundly heal ourselves emotionally, to eliminate limitations, tensions and traumas which we may sometimes carry with us for years, keeping us chained to continuous sadness, suffering and resentment. 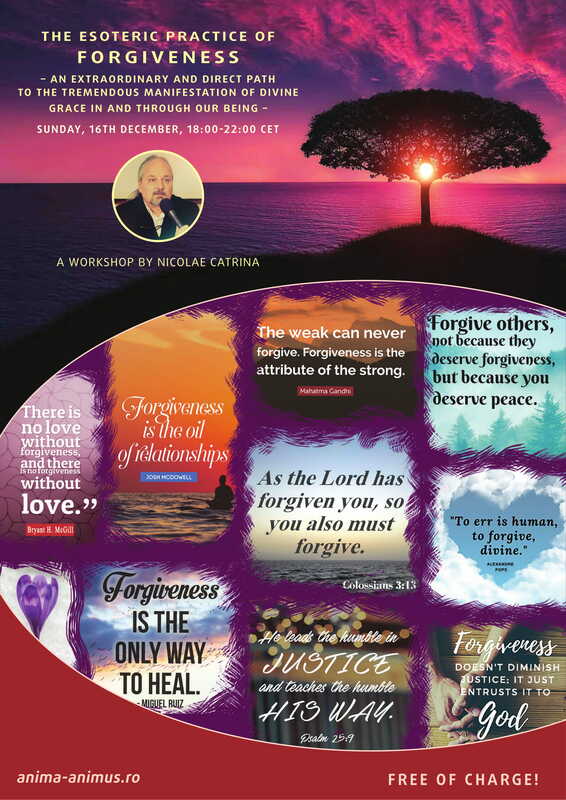 The main obstacles that may prevent us from successfully applying the practice of Forgiveness. Join us on this trip of healing and liberating our souls from the trap of resentment, traumas and suffering! The price for the workshop is €35. As soon as payment is confirmed you will receive the link with the video recording of the workshop.